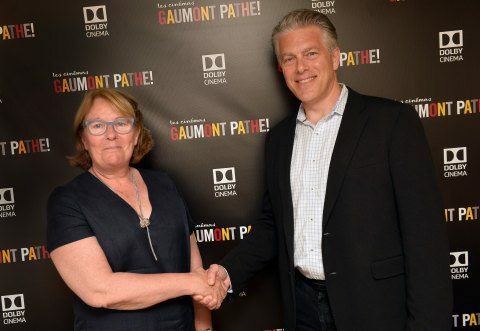 San Francisco & Cannes, France (May 26, 2017) – Les Cinémas Gaumont Pathé, the largest cinema chain operator in France, the Netherlands, and Switzerland, and Dolby Laboratories, Inc. (NYSE: DLB) announced plans to open 10 Dolby Cinema locations, with seven in France and three in the Netherlands. This includes Amsterdam and Rotterdam in the Netherlands, and the upcoming new Pathé cinéma in Massy, south of Paris. Initial locations are expected to be open by Fall 2017. Dolby Cinema is a premium cinema offering for moviegoers that combines spectacular image and sound technologies with inspired design to deliver the total cinema experience, making every visit a completely captivating cinematic event. Dolby Cinema features the Dolby Vision laser projection system, which uses state-of-the-art optics and image processing to deliver high dynamic range with enhanced color and a contrast ratio that far exceeds that of any other image technology on the market today. The result is a richer, more detailed viewing experience that delivers strikingly vivid, realistic images and makes viewers feel like they are in the movie’s world. Dolby Cinema also includes Dolby Atmos sound technology, which moves audio around the theatre, even overhead, with amazing richness and depth. The combination of Dolbytechnologies with the design and comfort of the Dolby Cinema makes audiences feel closer to the onscreen action. When these technologies are combined with the sophisticated Dolby Cinema design, everything comes together to pull moviegoers more deeply into the story and transform their visit into an event. In just over two years, more than 325 Dolby Cinema sites have been installed or committed to across the globe, with more than 85 titles released or announced. For more information, please visit the Dolby Cinema web page. Les Cinémas Gaumont Pathé is the biggest cinema chain operator in France (71 movie theatres), the Netherlands (25 movie theatres), and Switzerland (8 movie theatres). It is also present in Belgium (5 movie theatres). At the end of 2016, Les Cinémas Gaumont Pathé operated 109 movie theatres totaling 1,080 screens, 66,8 million admissions and 743 million euros in revenue. Les Cinémas Gaumont Pathé pairs the continuous modernization of its movie theaters with the never-ending pursuit of innovation. This quest for constant refinement rests on an active policy of construction, reconstruction and renovation of movie theaters and innovative projection technology. Les Cinemas Gaumont Pathé is owned by Pathé, one of the biggest film producers in Europe and a major player in film distribution.